My to-be-read list is usually stacked at least 20 books high and planned a few weeks ahead so it takes a monumental shift to change it. N. K. Jemesin’s The Hundred Thousand Kingdoms managed just such a change. Due to the incessant online buzz and the overwhelmingly positive reviews of this fantasy debut I couldn’t ignore it any longer and while not all the hype is justified it is a strong freshman outing, sufficiently different in approach and style to deserve high praise. The world is ruled by the Arameri. From the heights of the magically constructed Sky City they look down on the rest of world using the powers of enslaved Gods to wield absolute control over every nation with cruelty and utter disregard for the lives of others. Following the suspicious death of her Mother, Yeine Darr an outcast tribal leader from the barbaric north is summoned to Sky City to appear before Dekarta, Head of the Arameri. Expecting the worse, to her amazement she is named as the third heir to the Arameri throne, in competition with two scheming cousins and now, thrust into the vicious politics and petty infighting of the court she must navigate her way out of the situation by finding allies and staying alive. But who can she turn to. Another Arameri? Her rival cousins? The enslaved Gods? Or is she truly on her own this time. The story is told in the first person from the point of view of Yeine. Now I’m not a big fan of first person narrative so I had to get over myself to get started but the tone of voice is easy and straightforward and along the way there are digressions and asides that keep things interesting, so fifty pages in it’s no longer an issue. The downside of course is that you know in advance that the story-teller lived to tell the tale which lessens the impact of any potential jeopardy, even with an unreliable narrator, and of course if you don’t like the narrator then you just won’t care what happens either way. Personally I found Yeine likeable enough to follow and the writing is certainly good enough to keep you engaged throughout but there are times when you are thrown out of the story by short asides in which the reader is not a participant and frankly it’s just unnecessary. That said, The Hundred Thousand Kingdoms is a good book. The world is a complex mix of magic and politics exploring gender roles and themes of identity throughout particularly through subjugation and slavery; of the lesser Arameri by those of higher birth, of the Gods by the Arameri, of the lesser nations by the more powerful ones and so on. As Yeine comes to terms with her family history she works hard to find out more about her mother in order to discover more about herself and how she fits into this strange new world and woven into the fabric there is a romance – not forbidden but dangerous nevertheless – that, while acceptable, too often hovers into the worst excesses of Mills & Boon. Jemesin’s writing style is easy and fluid making the 400-odd pages a relatively quick read. The story has a unique flavour and while it takes its time to get going and doesn’t seem like it’s all going finish well, the end, when it comes, pulls together all the threads in a satisfying way and leaves you wondering where the next instalment can possibly take you. Not the “best fantasy debut of the year” for me but a solid tale with a unique mythology that is extremely well written and you can’t ask for much more that that. 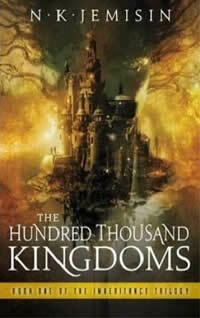 The Hundred Thousand Kingdoms is published by Orbit and is available from Play.com, Blackwell, and all good book stores.